'Tis the season for parties!! 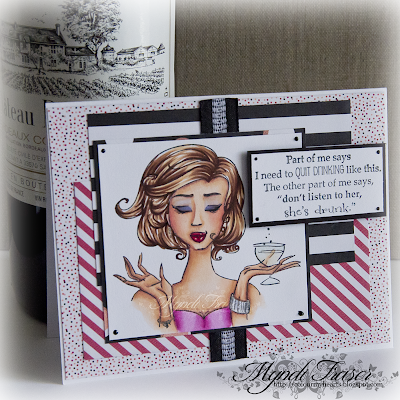 And since it is, I did a funny little card with "Ellynn" and the "Quit Drinking" sentiment from Rubbernecker Stamps. I think I have had enough parties already this Christmas season and it's not even December yet! 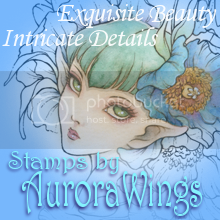 I used some discontinued papers from Stampin' Up, and coloured the image with Copics. 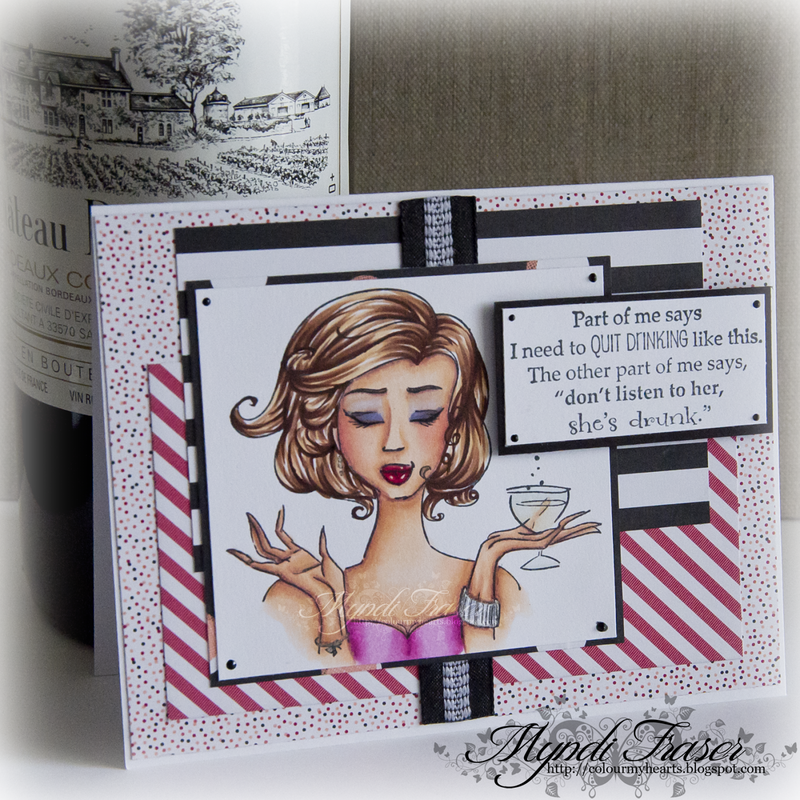 This was a fun card to make, and I used a sketch from my friend Cristena (who really likes my wine bottle prop ;-) ) to put it all together. I needed to make a Christmas card for my twin daughter's preschool teachers. If I had more time, I would do one for each, but I don't, so one card for the three of them will have to do. Tiddly Inks' "Jill - Spirit of Christmas" is perfect for what I wanted to do because my girls actually have similar hair cuts to the girls in the image. I coloured them in their favourite colours too! I used Copics to colour the image, Michele R Designs digital papers, embellishments and flowers from Live & Love Crafts and Wild Orchid Crafts. This month's challenge is "I Can See Clearly Now". You need to add something sheer or transparent to your project to follow the rules, and use a TEW image, of course. My image is "Lovely Winter Couple" and I used white vellum layered over blue cardstock, which I dry embossed with a Softly Falling embossing folder from Sizzix that is available through Stampin' Up, and my snow flake embellishments are both crystal clear and translucent with a blue tint. I've layered them and used little silver star brads to hold them together. You can join us in The East Wind's Facebook group for a monthly contest, and on the BLOG for twice monthly challenges. The challenge on the blog that starts on the 1st of every month is the freebie challenge, and to get the freebie you need to be signed up for the newsletter, so make sure you look for the bright pink box on the blog's homepage to sign up for that! Something different from me today for Rubbernecker Stamps. I'm taking a break from Christmas, and bringing you "Butterfly Shoes". I've also used the "Right Pair of Shoes" sentiment. I heat embossed both stamps with gold Tsukineko embossing powder. The gold ribbon is from May Arts, and the paper is scraps from my stash. I never throw anything away! The sketch is from a friend of mine who manages the Rubbernecker DT. Today is Rubbernecker Stamps' Team 1 Sweet Sunday post, and if you visit the Rubbernecker blog you get a card from all of us on Team 1. Make sure you go by the blog and check everyone's amazing cards out. I used the new "Santa with Tree" stamp for today's card, along with the new "Happy Holidays" sentiment stamp. This was a fun and easy card to make. I really love these new Santa stamps! All of my DP is from Stampin' Up. 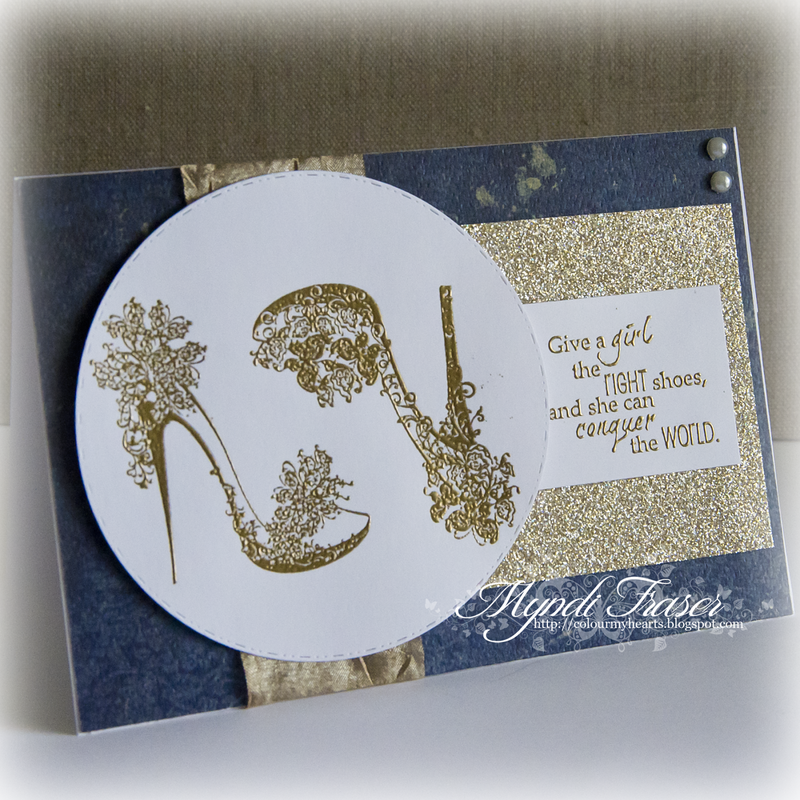 I used the Holly embossing folder from Stampin' Up too! It was a Stampin' Up kind of day, I guess. We very were lucky to have the Rubbernecker folks send us a bunch of ribbon from May Arts to make our cards with. They are really an amazing stamp company, family owned and run. They make all of their own stamps! Today is a new release day at The East Wind, and today's image is "Plant Love to Harvest Love". A pretty relevant idea these days given the unrest in the States after a very divisive election. I coloured the image with Copics. My laces are from Live & Love Crafts, which is now closed. The flowers are from Wild Orchid Crafts. The butterfly is a Martha Stewart punch. The sentiment stamp and the tag are from Stampin' Up. You can join us in The East Wind's Facebook group for a monthly contest, and on the BLOG for twice monthly challenges. The current challenge in the Facebook group is "Come Over To the Dark Side". The challenge on the blog that starts on the 1st of every month is the freebie challenge, and to get the freebie you need to be signed up for the newsletter, so make sure you look for the bright pink box on the blog's homepage to sign up for that! More Christmas Fun with Rubbernecker! Hi all!!! Back again with Rubbernecker Stamps new Santa stamps. 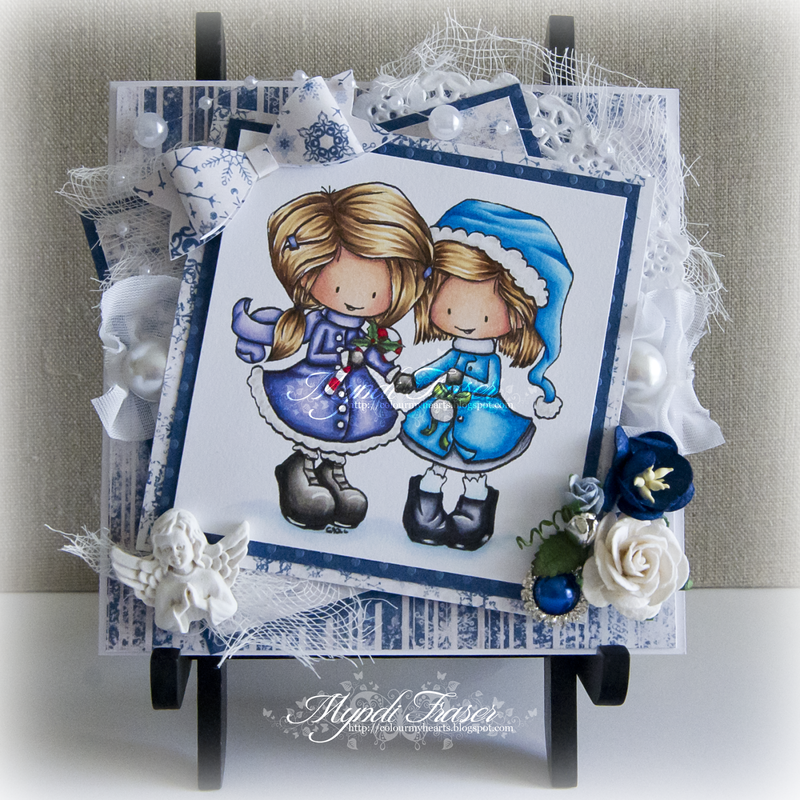 Today I'm using "Santa with Present looking right" and the new sentiment stamp "Heavenly Christmas Season". The paper I used is from Martha Stewart. 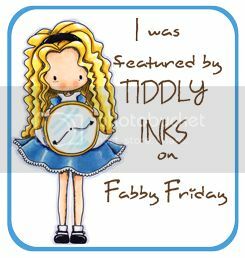 It is double sided so I used the dark slate blue side to mat the image and sentiment, and with the pale blue side I used a Sizzix Softly Falling embossing folder from Stampin' Up. I embellished with some beautiful ribbon from May Arts, and an ornament die cut from Stampin' Up's Merry Tags die set. I coloured the image with Copics. Hmmm.... that's a hard one for me to answer. But I had to narrow it down for the new Stella Team challenge at Aurora Wings "Your Favourite Quote". I guess my favourite quote depends on how I'm feeling. There are some quotes by Marcus Aurelius that blow me away. They are so relevant even today, and he lived in 121 - 180 AD!! I think he was a really brilliant man. I also really love the works of Thich Nhat Hahn. He is a Zen Buddhist monk who writes some very beautiful books regarding peace and mindfulness. "True Love: A Practice For Awakening the Heart" is a really beautiful book. But for my project, using Aurora Wing's Lady Of Compassion, I chose a quote by the 14th Dalai Lama. He has a really great message about compassion and the purpose of life, and how to achieve happiness. It really speaks to me and I hope that I incorporate it into my daily life, if not always, at least a little every day. "The Compassionate Life" is a book that I highly recommend to anyone, and since compassion was the ruling force in my life last month, this was the quote and the image I chose for this month's new Stella challenge: "Only the development of compassion and understanding for others can bring us the tranquility and happiness we all seek." This quote is simple enough, but seems to be a hard idea for people to grasp. It seems the world is lacking a lot of compassion these days. I coloured the image with Copics, and tried to keep a soft colour palette. I chose not to do any embellishments, and mounted it on a khaki coloured canvas board with a Kaisercraft DP mat. This image was offered for sale as a single purchase digi for a limited time in September. If you didn't get her then... well you are in luck, because Mitzi is making her available again for the duration of this challenge since Ann-Marie and I both used this image for our projects this month. You can also find her in the Gardens and Goddesses colouring book, Vol. 1, which is temporarily sold out. This is the single image and I printed it out at 5x7". 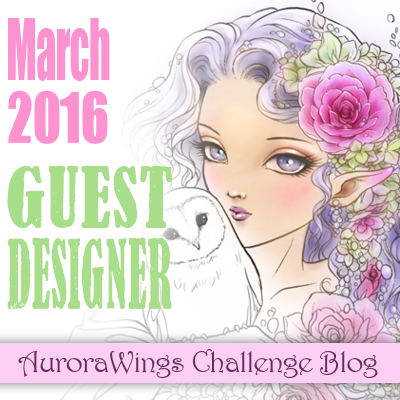 Please stop by the Aurora Wings Challenge blog and join in with YOUR favourite quote. 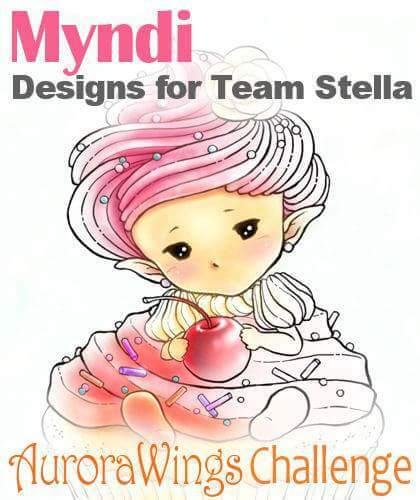 Please check out the RULES for the challenge, and while you're on the blog, visit my fellow Stella DT member's blogs to leave them some love for their projects.